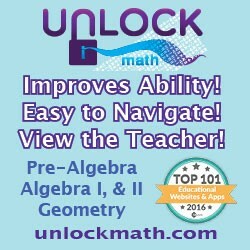 14-Day FREE Trial Video presentation lessons: Pre-Algebra Algebra1 Algebra2 Geometry Pre-Calculus/Trig.- Coming Soon Math Grades 5/6 – Coming Soon by Emerson Sandow UnLock Math is the first homeschool math curriculum to combine a variety of learning styles into one in multi-sensory and interactive curriculum. Alesia and Matthew Blackwood have designed a creative program from homeschooling families unlike anything on the market. It is evident throughout Alesia’s work that she understands the struggles math students face from years in the classroom. Students shouldn’t have to struggle through their math careers from such and early age; Alesia conveys her enthusiasm for math in such a way that it gets your child excited to master new concepts. Who would have thought that after so many years of struggling, math doesn’t always have to be the “dreaded” subject! I have outlined below some of the key features that I think sets UnLock Math aside from other programs on the market and shows you that you are in fact getting the most “bang for your buck” with this curriculum!